Acne Remedies and Treatments from Reviva! When it comes to skincare, who needs fancy packaging or an expensive price tag? The most important thing is that the product works. And the more natural the ingredients the better. Step 1: Cleanse with Camphor Cleansing Milk ($8) for oily or blemished skin. This simple formulation is blended with imported camphor added for its astringent and anti-bacterial properties. Unlike other acne washes, it gently cleanses and doesn't leave my skin feeling dry. And since I started using it, I haven't had as many breakouts. I should mention, however, that I also regularly get LED light treatments for acne and anti-aging. Step 2: After I wash my face with the Cleansing Milk, I use Camphor Toner ($8). I used to think that toners had to smell as strong as Sea Breeze and make your skin tingle to prove they're working. But Reviva's Camphor Toner is gentle and refreshing. It helps to restore the skin's normal pH balance, stimulates circulation and fights the excess oil that causes acne. It's become my favorite toner, next to Shobha's Rose Water Toner. 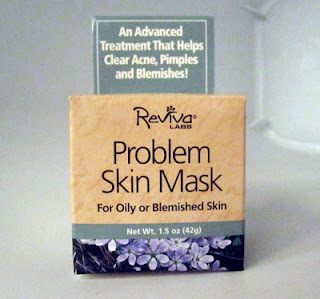 Step 3: The Problem Skin Mask ($13) works wonders for blemished skin. Whenever I get a breakout, I apply a thin coat. Sometimes I apply the Problem Skin Mask and let it dry before I shower, and sometimes I dabble it on before I go to bed (I know you aren't supposed to sleep with face masks on, but I can't help it). The lightweight, cooling mask absorbs oil and helps clear blemishes with zinc oxide, camphor and sulfur. Sounds like an interesting product to try. I suffer major blemishes.